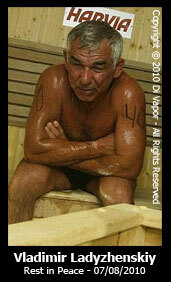 The latest Sauna World Championships ended in tragedy on Saturday 7th August 2010 when one of the finalists died. Vladimir Ladyzhenskiy, a Russian amateur wrestler in his 60’s, along with rival veteran Timo Kaukonen both collapsed with severe burns after about 6 minutes into the round. Sadly, Vladimir Ladyzhenskiy died late on Saturday. Hakon Eikesdal, a Norwegian photographer reported that both were shaking and bleeding from what appeared to be severe burns. Ossi Arvela, a competition organiser said that the competition will never be held again after this tragic occurrence. Timo Kaukonen is reported to be in stable condition in hospital as of Sunday.